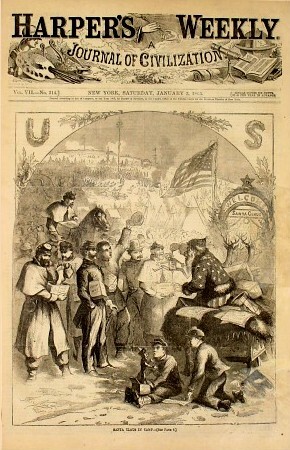 Christmas day 1864 occurred 150 years ago today. On both sides, soldiers hunkered down in the trenches surrounding Petersburg and attempted to celebrate as a horrific war and a horrific campaign ground relentlessly on. The Confederates in particular were hard pressed to find joy, or even a good meal, to commemorate the day. On Christmas Day 2014, I’m going to try something a little different. I’ve collected memories of the Christmas of 1864 at the Siege of Petersburg from various regimental histories, hopefully giving you a small sense of what Christmas on the front lines of a bloody war was like for the men who fought in it. December 24th, the band of the Thirty-Ninth came to the hospital in the evening chaperoned by the hospital steward, Anthony De Normandie. After some music in front of our headquarters, we showed them the way to the quarters of Miss Barton, where several pieces were played, and at last we were invited in to take a little milk-punch, provided for us, together with a “Christmas eve” collation. After doing the “nice thing” by the band we returned to the writer’s quarters, where we found the band of the Eighth Connecticut, who had also come down for a little stimulation. In proceeding farther we met with General Osborn and his acting Assistant-Adjutant-General, Captain Nevins, and at once ordered in egg-nog, for this was possible, as we had a large number of hens connected with the hospital and belonging to Surgeon Richardson. The affair was enjoyed amazingly, and the “wee sma’ hours” approached before we were permitted to go to bed. The Thirty-Ninth and the Eighth Connecticut bands took turns in giving us music, and when invited inside were as zealous in appropriating “something to wet their lips. '” The whisky was bought from the division commissary, and how they ever got home was a “nine days’ wonder” to us. After a few weeks great preparations were made for the approaching Christmas and New Year. The camp was beautifully trimmed with evergreens, the entrance of each street being graced with green arches, the cedar boughs interspersed with red holly berries, arranged in fantastic forms, and each tent was adorned according to the taste of its occupant, some of them presenting a fit subject for the artist’s pencil. I wish I might here record the arrival of the Christmas turkeys so liberally contributed by our friends at home, for the benefit of their soldier friends, fathers and brothers, in the field. We had been led to expect a perfect feast of good things; but to our great disappointment, and to the shame of whoever was the cause of it, they failed to reach us. We had received word that a large box had been forwarded expressly for the Twenty-first, from Norwich. And our mouths were all made up for a good taste of mince pies, roast turkeys, etc., etc., and as the day approached, frequent were the inquiries if the box had come. But no box came, and we were compelled to put up with our usual allowance of salt pork and hard tack. And I deem this a fitting occasion to state for the information of our friends, that not one fourth of the contributions for the regiment as a regiment have ever been received. I am unable to state at present upon whom the blame should fall. But should the eye of any concerned chance to fall upon this account, it is hoped that they will be careful to conceal all evidence against them, for, should they ever be discovered, their reputation will most decidedly suffer in this regiment. But, notwithstanding the loss of our Christmas dinner, the day, though wet and muddy, was given up to festivity. And when the chance is given, one need not fear that ” the boys” will fail to make merry. The men were relieved from all duty not absolutely necessary, and “got upon their muscle,” and a vast amount of laughter by their sack and hurdle races, greased poles, greased pigs, pursuit of wealth under difficulties, wrestling matches, etc., ending up with a mock dress parade. And Jack Falstaff’s crew certainly never presented a more ludicrous appearance than these Christmas votaries in their improvised rags and costumes, and Christy himself could not surpass the paper collars here displayed. If you ever have occasion to get up a “rag-shag” procession in Connecticut, don’t fail to call on the Twenty-first. Their ingenuity in the line of costumes cannot be surpassed. The band, as it marched down the line, each member playing a different tune, and the bass drummer occasionally mistaking (accidentally of course), the unsuspecting pate of his file leader for the drum, and the huge appendage, like a fish’s tail protruding from under the coat tails of No. I, by his side, wagging in unmistakable approval, afforded infinite amusement to the crowd of spectators, although fearfully suggestive of a place called Bedlam. This will not reach you in time to present my respects in a “Merry Christmas,” so I will wish you a “Happy New Year” and many returns of the season, and tell you how I spent my Christmas. There are so few Sundays in the army that the occurrence of the holiday on that day was no drawback. 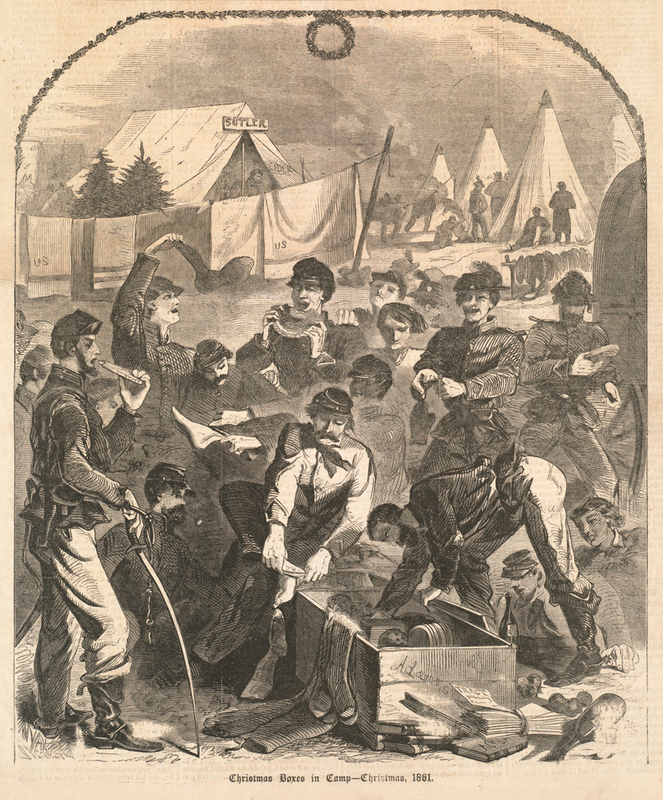 The military part of the festivity was a Division Dress Parade and the social, or our social part was a dinner at “Ye Quartermaster’s.” Lieutenant Burrows is a capital hand at carrying out anything of that kind and he determined to do the thing up right. We had two guests, Colonel Samuel C. Armstrong, of the Eighth [USCT], and Lieutenant Colonel Mayer of the Forty-fifth [USCT], two men who would be considered acquisitions in almost any social circle. Colonel A. was born in the Sandwich Islands and Colonel M. in Buenos Ayres, South America, and both are full of stories of adventure, travel and society. Mayer is the hero of half a dozen duels, which is not much of a recommendation, I know, but the custom of his country makes it a very different thing from dueling here. If any of you ever have a father, son or brother in far distant parts, don’t forget to send him an occasional box of good things from the old home. He may have an abundance, but even then he will appreciate the loving remembrances; but if he is undergoing the hardships and privations of a soldier’s life it will touch his heart more than any other act of your life. Two of our mess were remembered with a bounteous box of good things the Christmas we were in the trenches before Petersburg. Talk about your banquets! Your Delmonico spreads; your nine-course dinner! They cannot compare with that Christmas feast of home made mince pies, fruit cake, plum pudding, old fashioned twisted doughnuts, raspberry jam and other good things from home. And even those who were without mother or sister at home received through the Sanitary or Christian commissions many evidences that their devotion to their country’s cause was lovingly remembered by the patriotic women of the North. Christmas day passed very quietly. There were neither fine dinners nor jovial parties to be found among the troops on the Howlett’s Line; some apple dumplings were enjoyed in camp, and several invitations were extended by the Yanks for our pickets “to step over and drink with them,” but these were declined. The people of Richmond, and of other parts of the State, attempted to raise, by contribution, a grand New Year’s dinner for General Lee’s army, and after a great flourish of trumpets through the mouths of the daily papers, for at least some ten days previous to the time— it came. It was certainly a large donation, and spoke well for the generosity of its donors, but there was bad management in its distribution; consequently, great waste. Our Regiment received 42 pounds of meat, 20 loaves of bread, and 1 peck of vegetables—a quantity insufficient for more than one company, hence, the different companies concluded to draw lots for it, and Co. B was the winner. When we had about finished our huts we were moved out of them and further to the right, in quarters that Hoke’s Division had built. These were the most comfortable quarters we occupied during the war. They consisted of log huts twelve by fourteen, thoroughly chinked with mud and straw, some covered with dirt, others with split boards. We had splendid breastworks in front of us, built up with logs on the inside and a bank of earth from six to eight feet in depth ou the outside, a ditch of three or four feet beyond and an escarpment inside. At salients along the line forts for the artillery were built, but not now manned, and in front of our lines and around our forts mines or torpedoes were sunk, which would explode by tramping on the earth above them. Merry Christmas and Happy Holidays to all readers of The Siege of Petersburg Online. I wish you and yours the very best, and I hope you join me as I recount the last few months of the longest and bloodiest campaign of the entire Civil War.